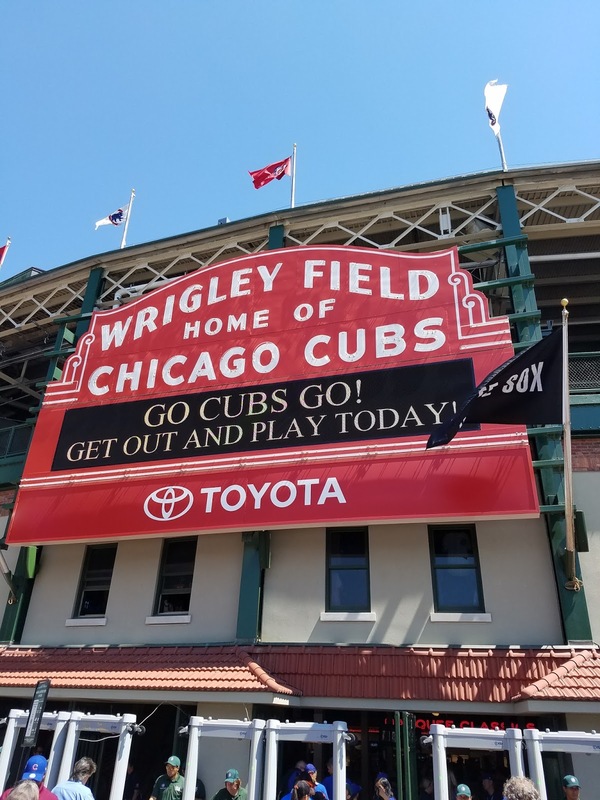 I am back home from my 4th National Card Show, and before I start blogging about everything I picked up there, I wanted to talk about what I was able to do beforehand. I was able to get up with my dad's best friend from elementary school. 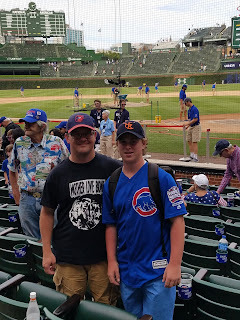 Kevin was kind enough to get some Cubs tickets and let me invite two friends to go to the game with us. 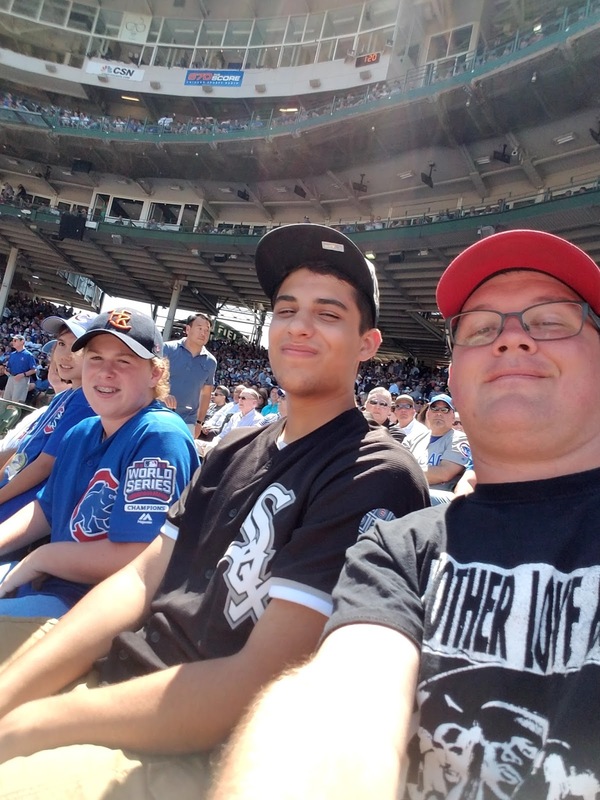 I was able to get my friends, Max and Anthony to come along and catch the game with us. 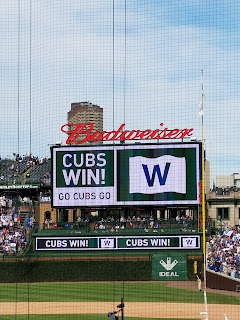 The game was the Cubs vs the White Sox. Max is an avid Cubs fan, and Anthony is an avid White Sox fan, what could go wrong? 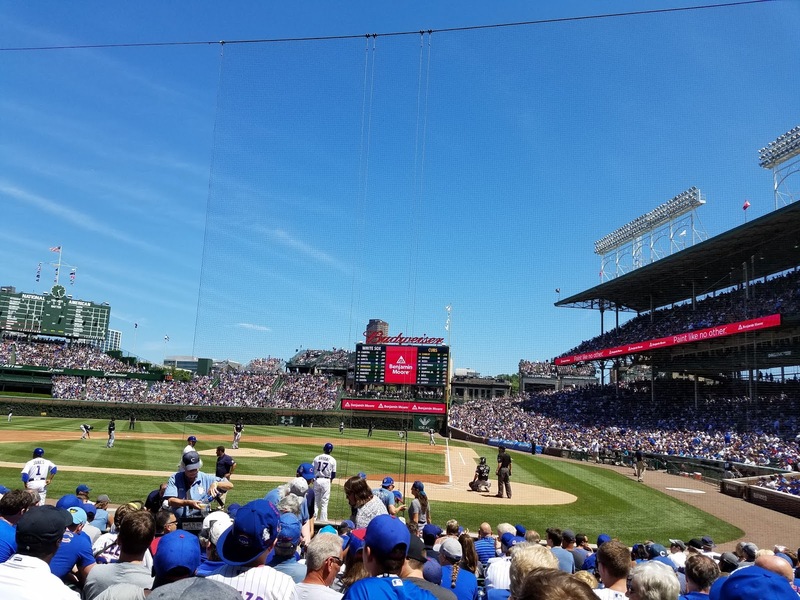 I was there for the atmosphere of a good baseball game, and Kevin was there because the seats were amazing. 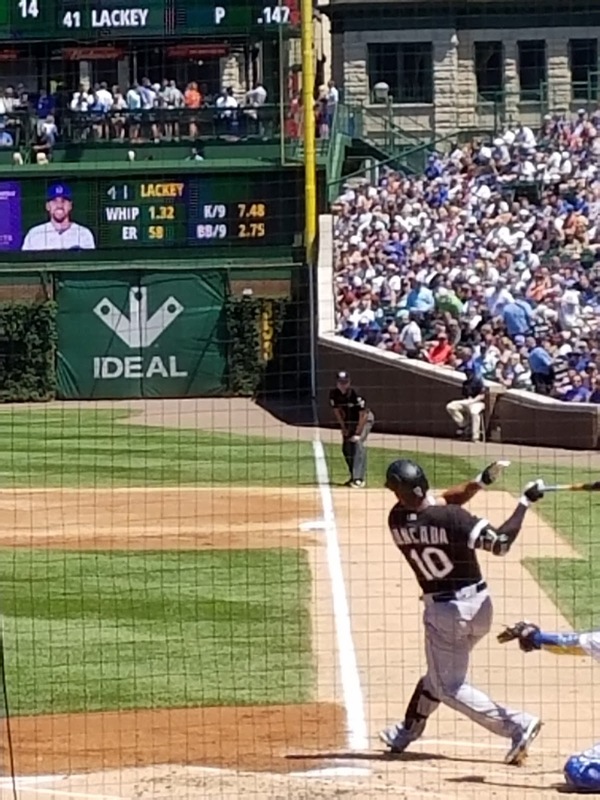 We were able to see White Sox rookie phenom, Yoan Moncada play. Moncada ended up going 0-2 with a walk. It was great finally meeting Anthony in person; he and I have traded in Instagram for years, and have become really close. 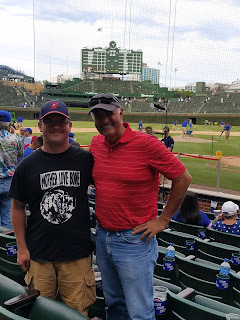 He's a great guy, and I was so happy that I could help him have this experience at Wrigley. Max, well, he and I have been friends for a long time, and this was my second opportunity to hang with him in person. In all, these two guys are great, and I am happy that I can call them my friends. 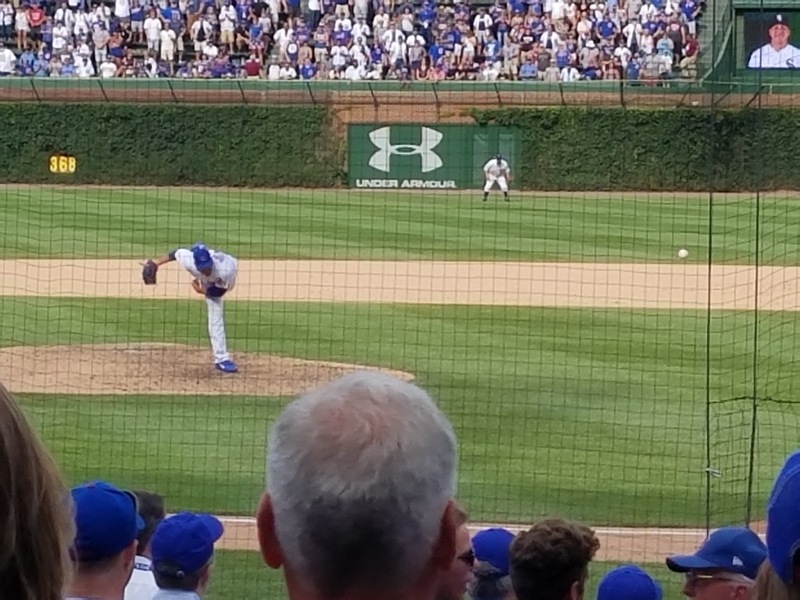 Back to the game, we got to see Kris Bryant get ejected for arguing balls and strikes. John Lackey hit 4 White Sox batters, and when Chris Beck hit a Cubs batter, we thought for sure the benches would empty. We didn't get any fireworks, but it was interesting. Our seats were 10 rows behind home plate, and we did see one celebrity sitting in our section - Frank Thomas. Anthony tried to get his autograph late in the game as Thomas was leaving, but was denied. 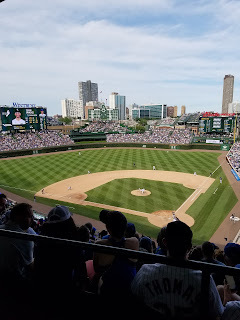 Max and I had gone to the top of the stadium to see if we could get Rick Sutcliffe, but we missed out on him as well. 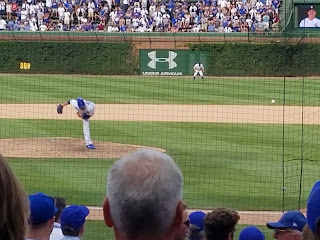 As you can see, our seats were awesome, thanks to Kevin. I'm glad he came along with us, as he seemed to have a great time. He really took a liking to Anthony, since they sat beside each other and talked quite a bit. 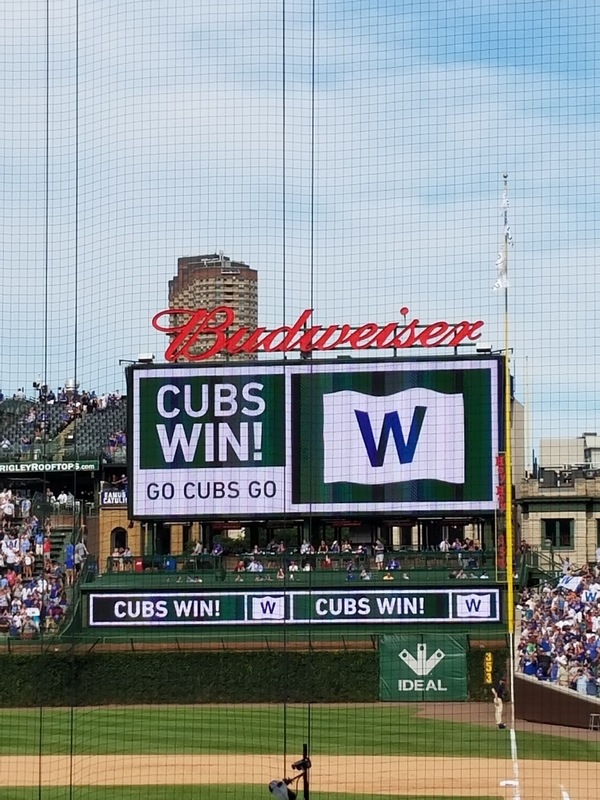 The Cubs won the game 7-2, so I got to see the W fly. The weather was beautiful, and we had an amazing time. I had to get a photo with Kevin after the game. I really appreciated that he went out of his way, not only for the tickets, but to make sure I was set for the National, and comfortable in Chicago. He's a great guy, and I hope he had as good of a time as Max, Anthony and I did. Poor Anthony had to leave early to catch the bus, so we weren't able to get a picture together after the game. I was able to get one with Max, though. I wish we could have gotten one with the four of us, but we didn't get the chance. Max and I did a little graphing after the game. He had a page of 4 Ben Zobrist cards (that I gave him), and I was able to get them done for him. 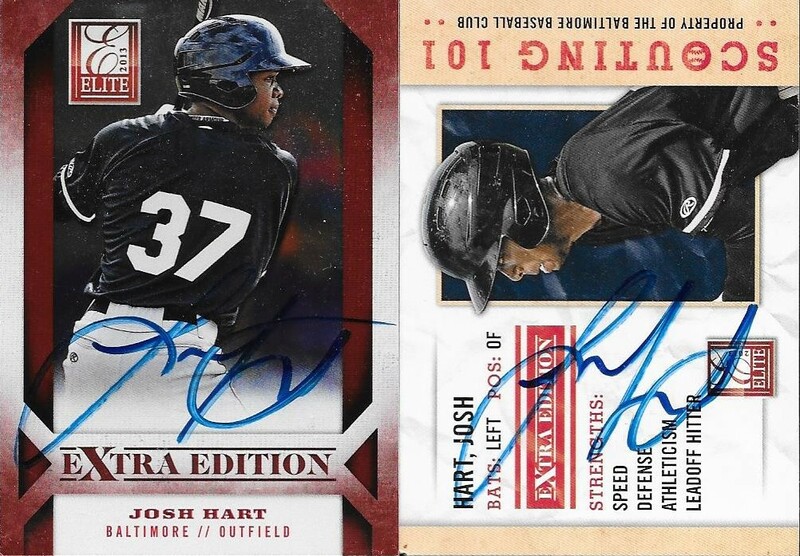 He let me pick the ones I wanted to keep, so I chose this 2016 Heritage purple chrome, and the below 2017 Topps. Again. I had an amazing time and made some great memories with my friends. Kevin came through in the clutch, and I am glad he also enjoyed himself. The four of us really enjoyed ourselves, I think. Thank you so much for your hospitality, Kevin! 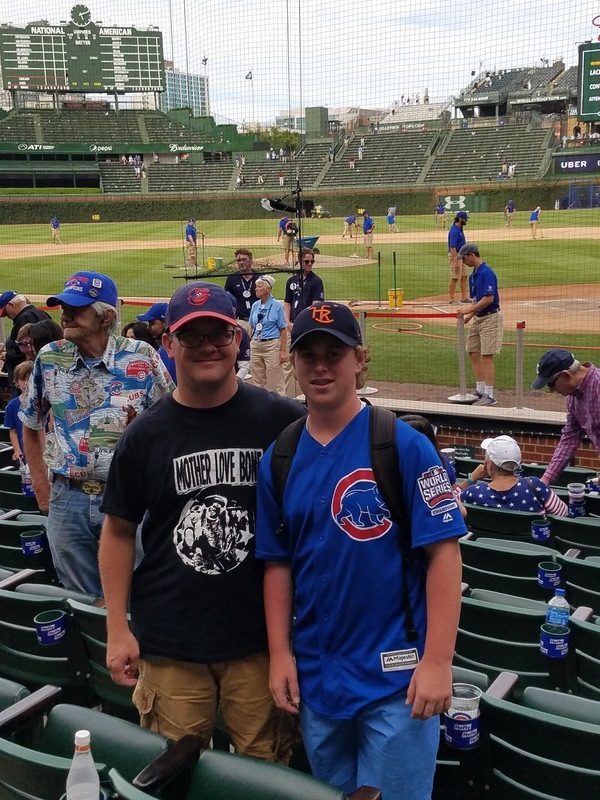 Also thanks to Max and Anthony for being able to catch the game with us! It took all 5 days of the National Sports Collectors convention, but I finally added another ball to my Hall of Fame collection. I looked all throughout the show to find a Ken Griffey, Jr. ball, and found one right as I was about to leave the show today (stay tuned for posts about the other stuff that I picked up). Griffey (b. 1969) played in the majors from 1989 to 2010 for the Mariners, Reds and White Sox. He finished his career with 2,781 hits, 630 home runs and a .284 batting average. He was the 1997 AL MVP. He led the AL in home runs in 1994, 1997, 1998 and 1999. Griffey hit 40 or more home runs in 7 seasons. He was a 13-time All Star, 10-time Gold Glove Award winner and a 7-time Silver Slugger Award winner. Griffey was elected to the Hall of Fame in 2016 when he fell 3 votes shy of being the first unanimous selection (440 of 443 ballots cast or 99.3%). 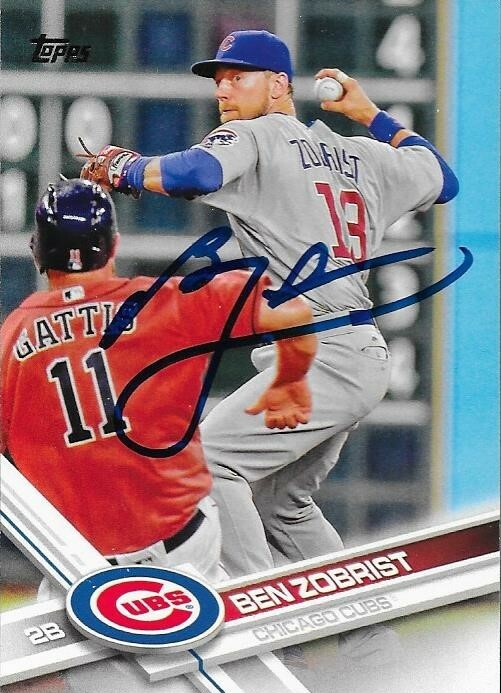 He is now my 133rd Hall of Famer in my collection. Here is a TTM success that I was really excited about, from Jeff Suppan. I had some nice cards of him, and they all looked great when they came back. 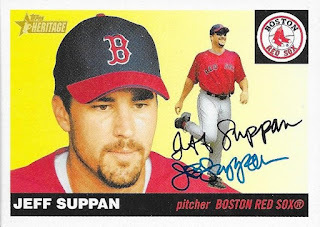 I had been wanting a 2004 Heritage signed for a while, and finally got one with this Suppan. I always have loved the 1955 design. 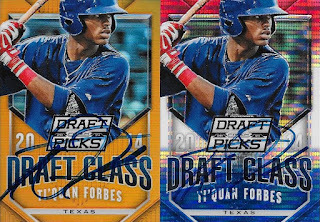 These two didn't scan too well, but they look good in person. The 1998 Chrome looks especially nice. 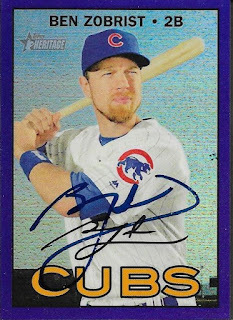 Finally, I added a few other cards to the list, starting with 2007 and 2010 Topps. 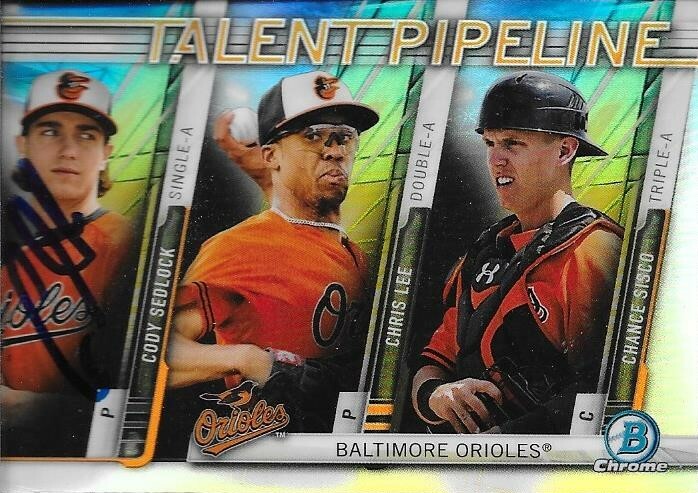 I like the Pinnacle Performers, and I also needed a Ginter Code Card in my binder. Suppan (b. 1975) played in the majors from 1995 to 2010 and 2012 for the Red Sox, Diamondbacks, Royals, Pirates, Cardinals, Brewers and Padres. He had a career record of 140-146 with 1,390 strike outs and an ERA of 4.70. He won the World Series with the Cardinals in 2006. 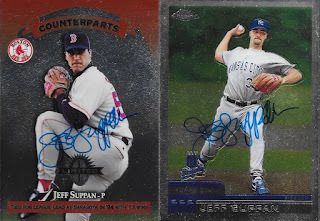 I mailed to Suppan on May 4 and got the cards back on July 20, for a 77-day TAT. 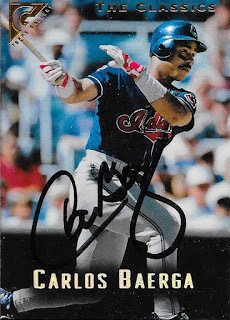 I added a really nice success to my list with this one from Carlos Baerga. 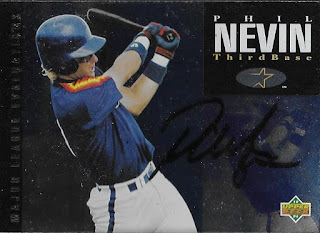 He was one of the better offensive second basemen that I remember from my formative years following the game. 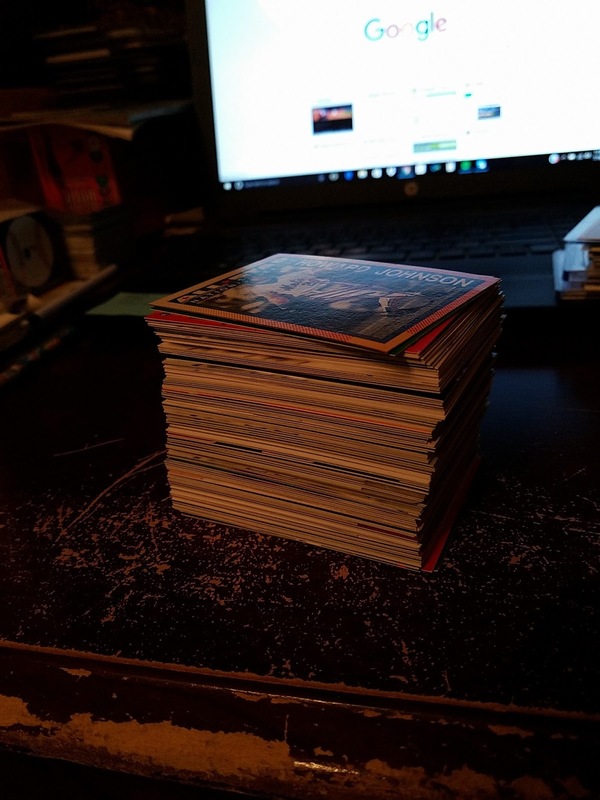 The above 1996 Topps Gallery turned out really nice, and it was out of the box I busted while I was at Andrew's house. I really liked the action shot on this 1998 Topps. The white Mets hat also looks pretty cool, I think. Finally, these two round out the success. 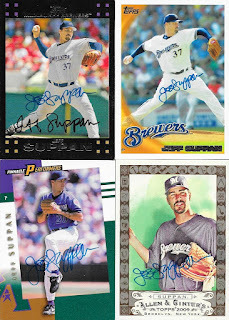 The 1996 Bowman looks pretty good, and the 1995 Stadium Club Super Teams card looks really freaky, but in a good way. Baerga (b. 1968) played in the majors from 1990 to 1999 and 2002 to 2005 for the Indians, Mets, Padres, Red Sox, Diamondbacks and Nationals. He had 1,583 hits, 134 home runs and a .291 batting average. He was an All Star three times (1992, 1993 and 1995) and was a Silver Slugger Award winner in 1993 and 1994. His best finish for MVP (AL) was in 1993 when he finished 10th. He appeared on the 2011 Hall of Fame ballot, but didn't receive any votes. 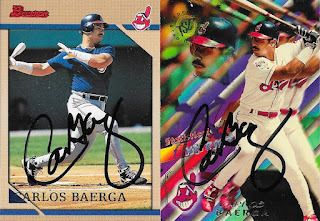 I mailed to Baerga on May 30 and got the cards back on July 20, for a 51-day TAT. 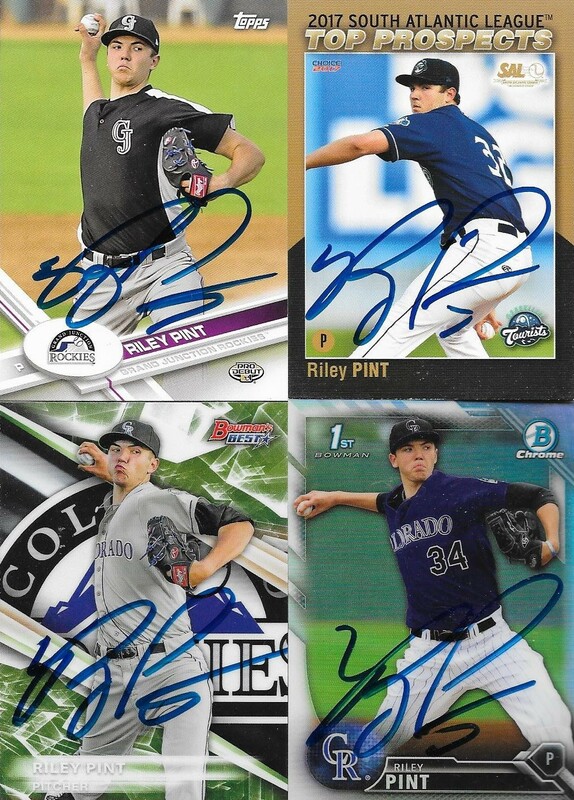 I got some nice cards back a few days ago that have been out for a while. All of the TTMs I have gotten in the last couple of weeks have been ones that I have been waiting a while to get in. This success from Matt and Misty May Treanor was one of the best, though. 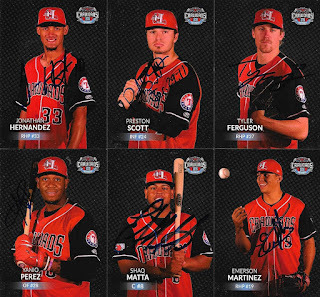 The above 2004 SP Prospects turned out really nice. It scanned really well, also. I powdered this one, and it helped out, as the signature looks about perfect. I also had these two cards that turned out nice. 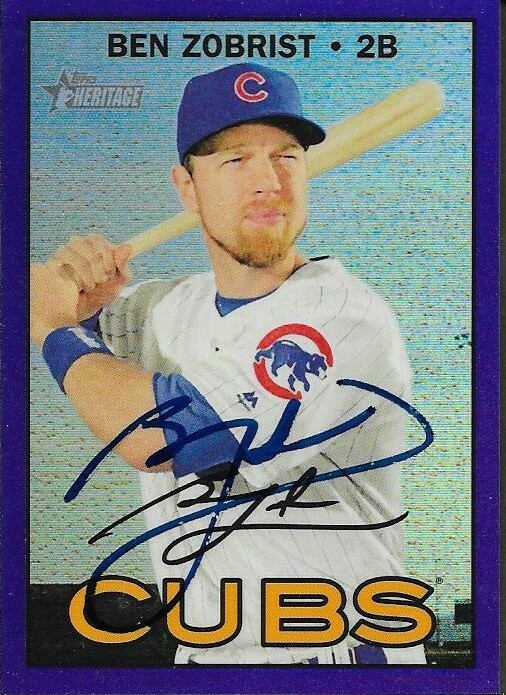 The 2011 is an Update series, so it won't count toward my Topps Project, but it still is a nice card. 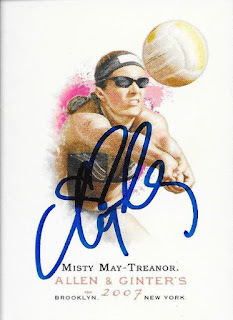 While looking for Matt Treanor cards, I found this Allen & Ginter card of his wife, Misty May Treanor. 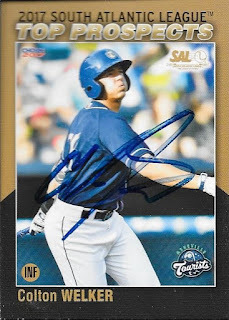 I tossed it in my envelope, not expecting much, but it came back signed with Matt's cards. Awesome! Treanor (b. 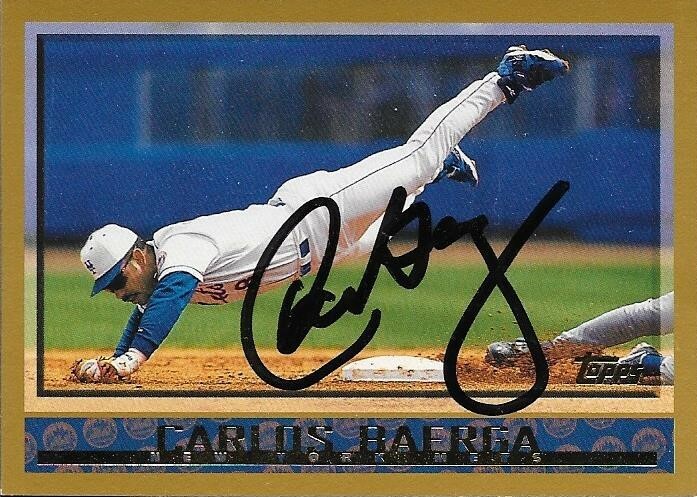 1976) played in the majors from 2004 to 2012 for the Marlins, Tigers, Rangers, Royals, and Dodgers. He had 281 his, 18 home runs and a .221 batting average. Misty May Treanor (b. 1977) won the Gold Medal for beach volleyball during the 2004 Olympic Summer Games without losing a set. Teamed with Kerri Walsh, Treanor won the Gold in the 2008 and 2012 Summer Olympics, as well. 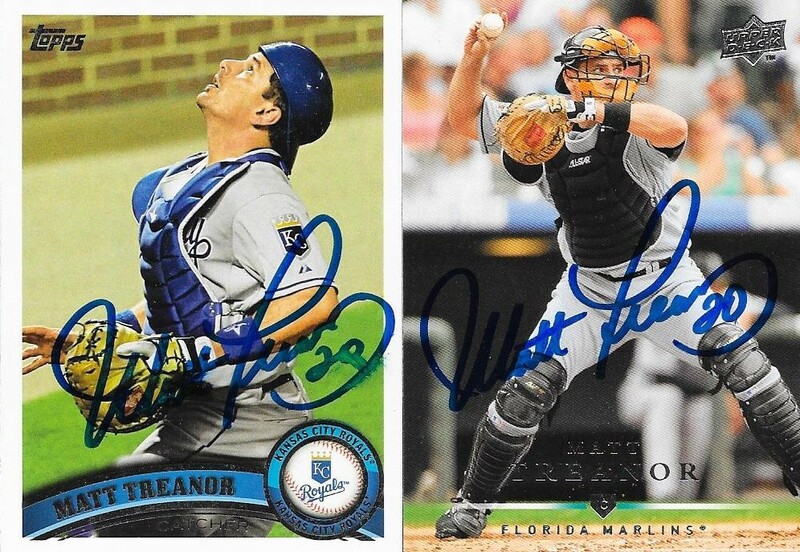 I mailed to the Treanors on May 8, and got the cards back on July 18, for a 71-day TAT. I wanted to get a game in this weekend while I was transporting Chris to my parents for his visit with them. 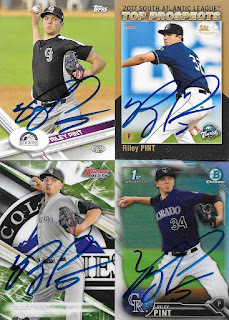 So, he and I checked out the schedule and decided to try to get Riley Pint with the Asheville Tourists. 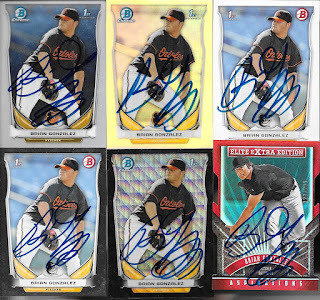 I ended up finding some more guys from the team and had enough time to get in some 50/50s from Gerard. I was able to get two Max George cards signed. 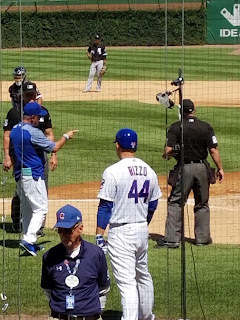 We couldn't get him inside the stadium as he was one of the last players to come out on the field and the coach had run Chris and I off (apparently, the players can't sign by the dugout...?). We ended up getting George at the team bus. I was really happy to get Pint. I had wanted to follow his career, so I had picked up a few of his cards. I was really worried, though, as I couldn't find the cards I had picked up until a couple hours before the game. I also found a Pro Debut in a pack of cards that I got at the card shop in Winston-Salem. Pint was really nice, and signed everything that Chris and I had. 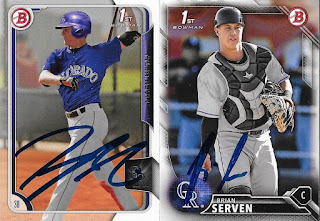 We also got Tyler Nevin and Brian Serven, I found Serven at the LCS, and Nevin I found through my last pass through my Bowman box before I left town. Finally, I got Colton Welker at the team bus. 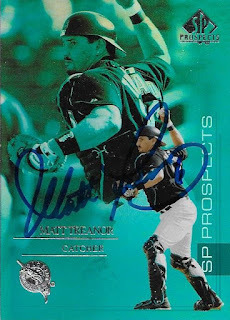 Welker was the last guy that I needed, and I really wanted to get this South Atlantic League Top Prospects card signed. Chris was ready to leave but we saw some players coming out, so we decided to wait out traffic and ended up getting Welker and George. Chris got two baseballs during the trip, and kept telling me how much fun he was having. I'm glad, because I'll miss him while I am on my trip. I got a couple TTMs in recently, after a long dry spell. This one from Phil Nevin turned out really nice. 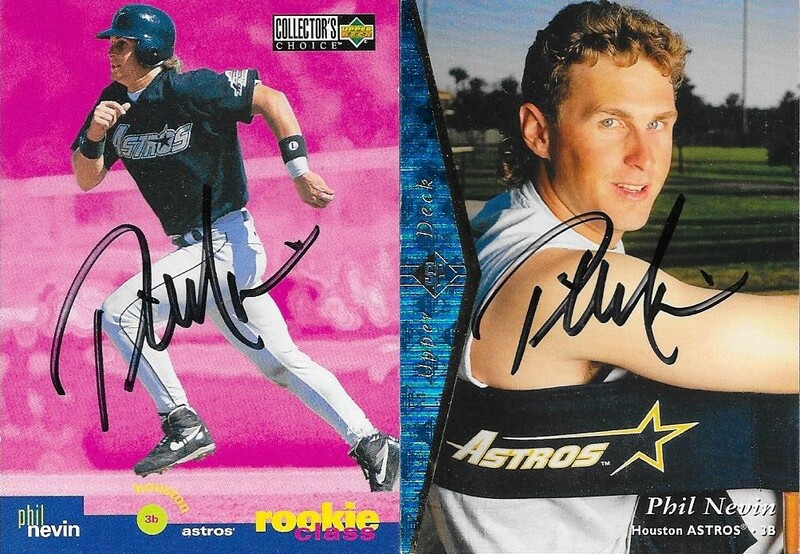 The 1994 Upper Deck Minors looks better in person, but didn't scan all that well. These two turned out really nice. The Sharpie he used was probably on its way out, but I'm still happy with them. 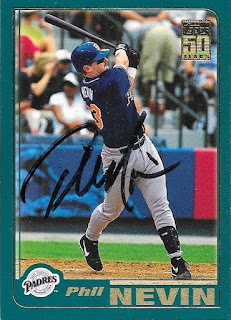 Finally, I added another 2001 Topps to the album. This came from the box of cards I got while I was at Andrew's house. Nevin (b. 1971) played in the majors from 1995 to 2006 for the Astros, Tigers, Angels, Padres, Rangers, Cubs and Twins. He had 1,131 hits, 208 home runs and a .270 batting average. 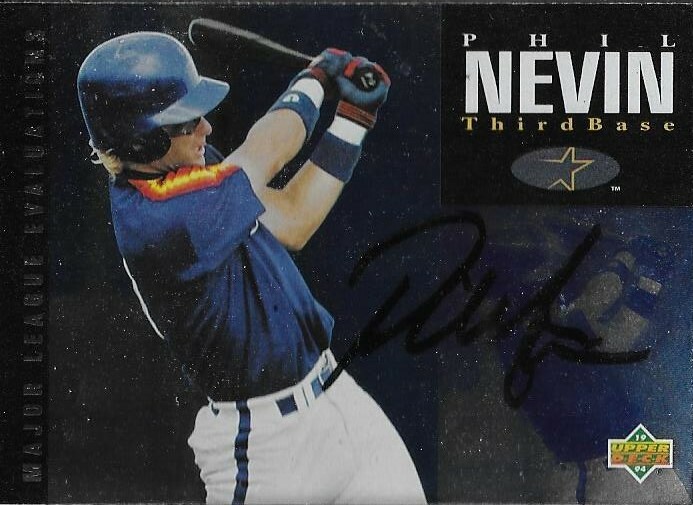 His best season was in 2001 for the Padres when he hit 41 home runs and made his only appearance as an All Star. 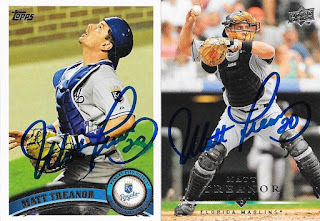 I mailed to Nevin on June 12 and got the cards back on July 15, for a 33-day TAT. This was the most anticipated series this season at Grainger Stadium for me. 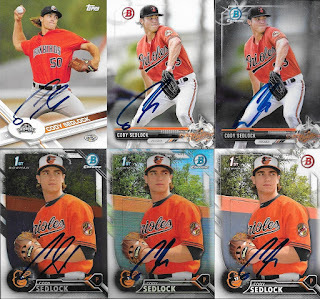 The Frederick Keys were scheduled for only one trip to Kinston this season, and I made sure I was prepared to rack some future Orioles, as well as some Wood Ducks. I made a few COMC and Ebay purchases so I would have some "different" cards for this series, and I also raided my Orioles PC boxes for some players who were on the Keys. Finally, I picked up a couple team sets to round things out so I could get autos of some guys that I may not have been able to, otherwise. 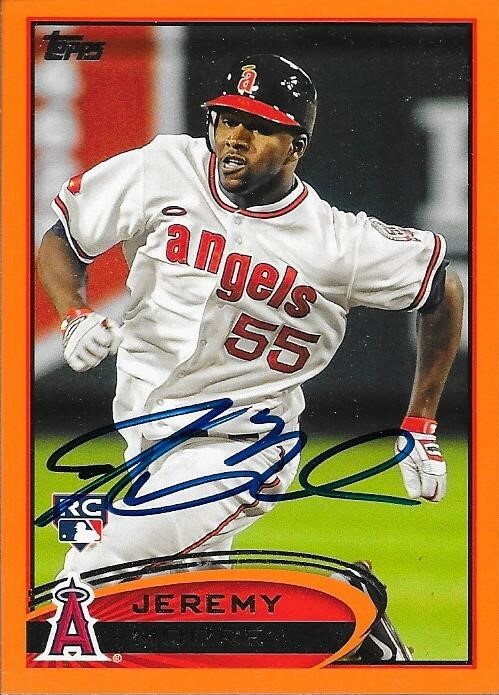 This 2017 Bowman Chrome orange refractor of Josh Morgan was an Ebay purchase, and turned out really nicely. 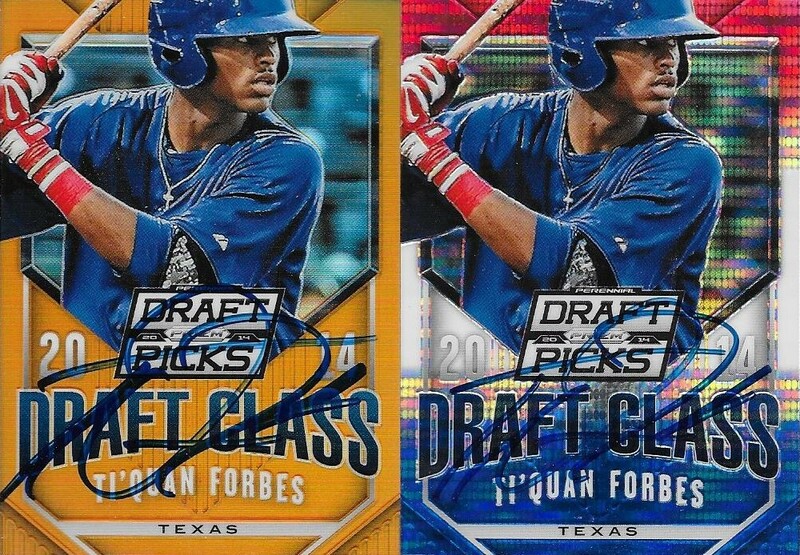 The card is numbered 6/25. I had help, of course, for this series. I had my son, Chris, and my nephew, Jacob, helping out. Their payment was a couple stacks of autos, once I completed 50/50s for my friends Gerard and Andrew. Another Andrew from Instagram sent along a couple cards, as well, which we were able to get taken care of. The above Jeremy Moore was a COMC pickup. He even asked about it, "Why is this one orange?" I explained to him that it was a factory set parallel. This card is numbered 60/190. 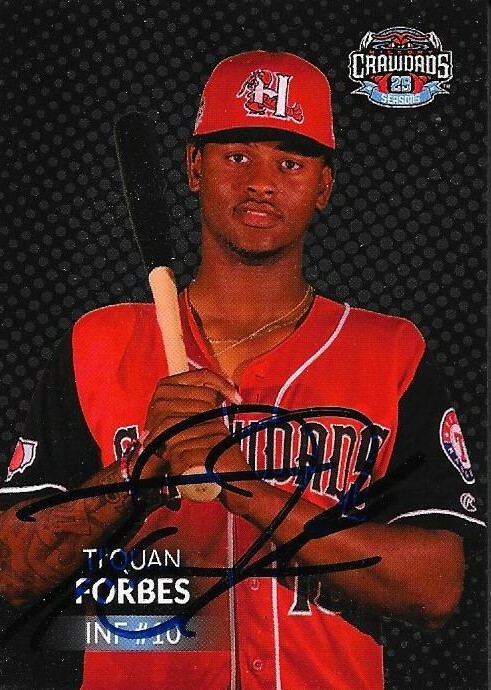 These Ti'Quan Forbes came from COMC. The red white and blue isn't numbered, but the orange is numbered 45/60. 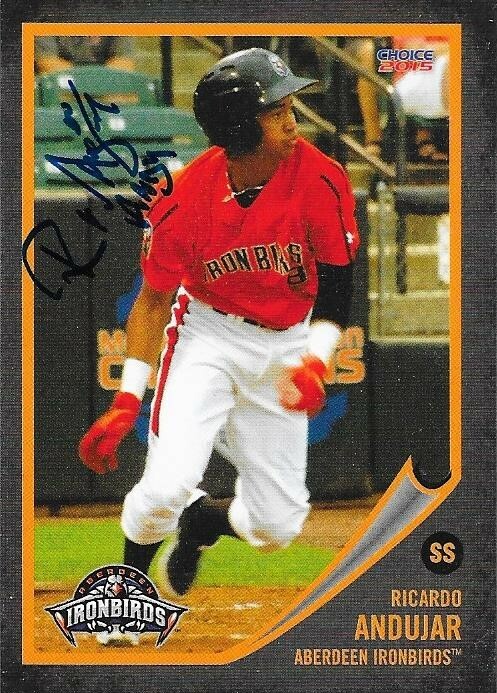 Since the Wood Ducks aren't producing a card set this season, I picked up the 2017 Hickory Crawdads set. 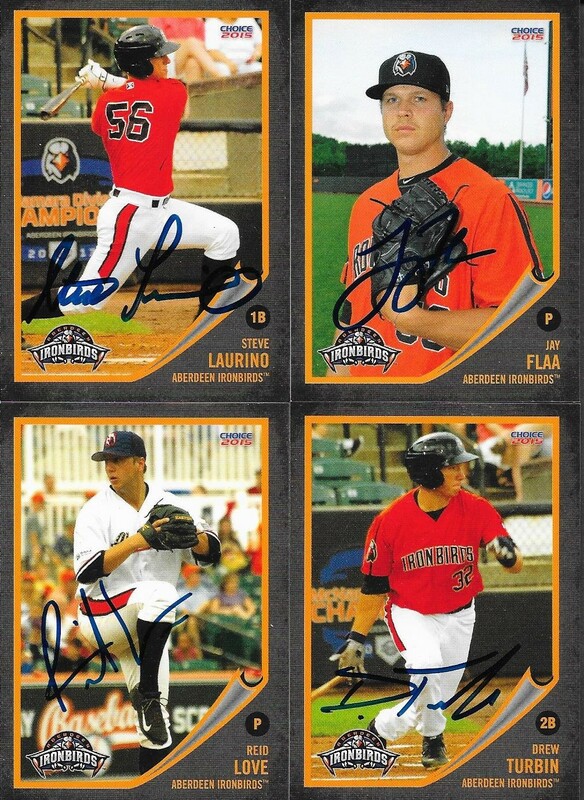 Several of their players have already been promoted to the Wood Ducks, so I went ahead and got a few signed. The cards are really dark, but they still turned out really nice. I'm glad I was able to get a few of these guys, especially Shaq Matta. He stops and chats with me briefly before every game, and always is smiling. I also picked up a couple Aberdeen Ironbirds sets, hoping I could use some of them on the Keys. I was able to get a few signed, which was nice. 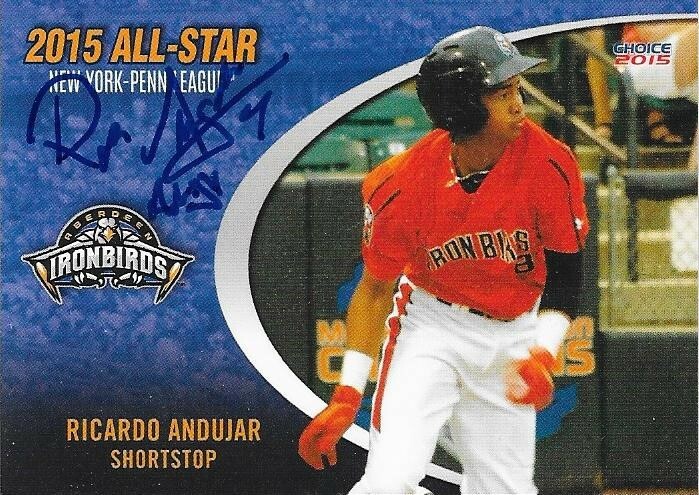 A couple of the players were in multiple sets, so I was able to get a couple different cards signed, Like Ricardo Andujar. 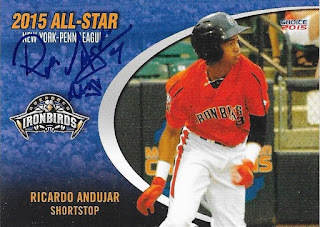 Andujar was a New York-Penn League All Star in 2015, so this card is pretty cool. I like how he signed it, as well. 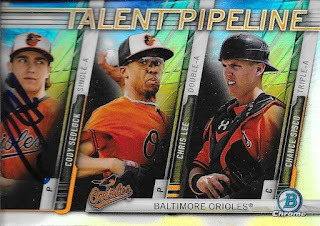 Believe it or not, I began looking up team sets because I wanted cards of Alexander Wells and Austin Hays. I got those guys, but they aren't with the Keys. The Keys guys were a bonus. 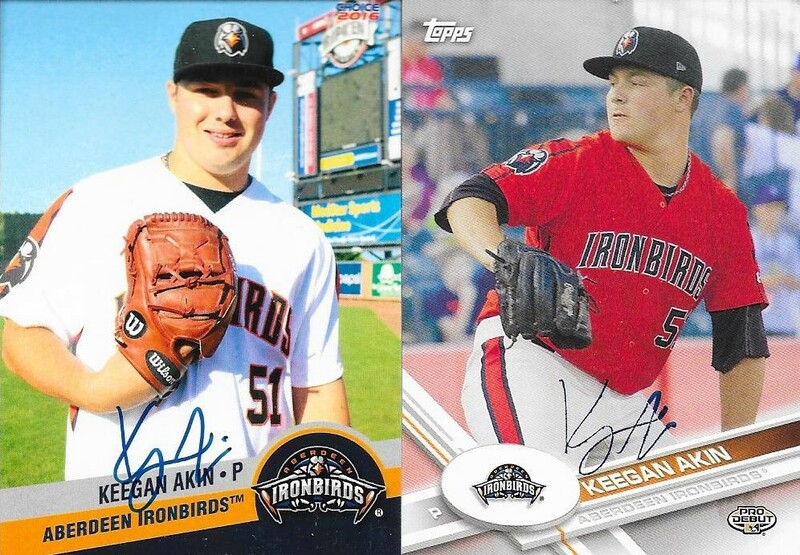 I was happy to get an extra card of Keegan Akin to go along with the 2017 Pro Debut that I picked up at the card show. His signature is really small and thin, but I like it. 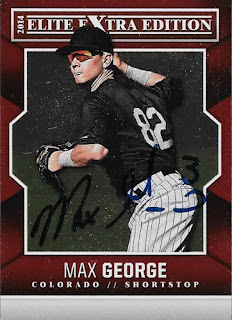 He was actually the first auto I was able to get during this series. 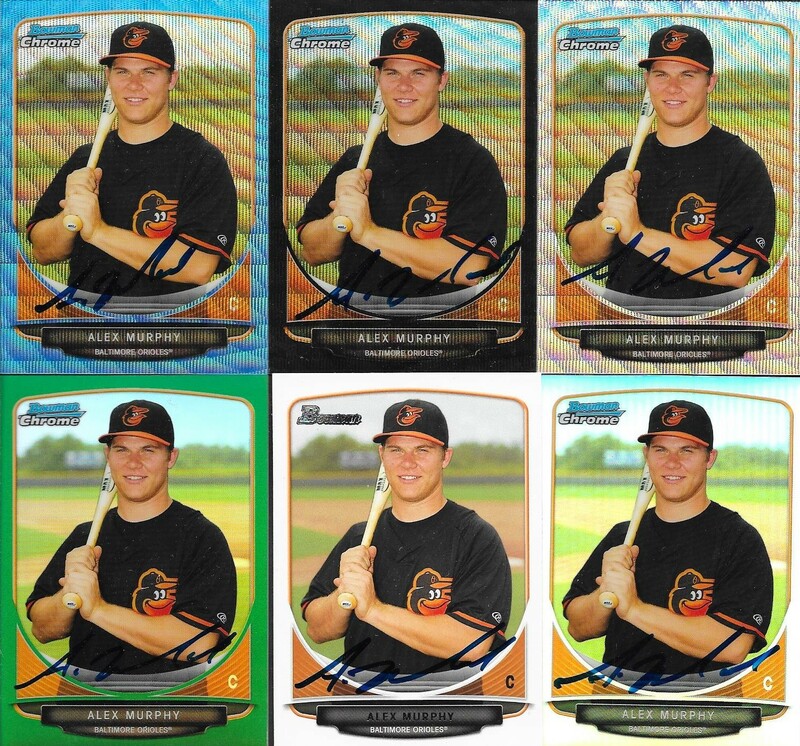 Randolph Gassaway has been in the Orioles system for a long time, as evident by the 2013 Bowman and Bowman Chrome. 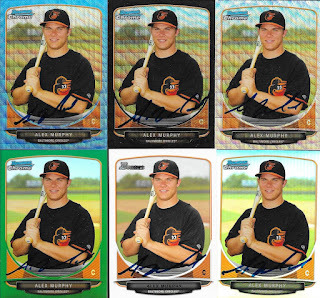 He has been playing really well, as of late, and may be on the Orioles radar, finally. 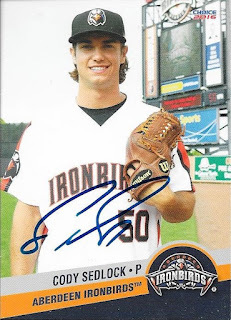 I figured that since Cody Sedlock was on the DL with a forearm strain (thank God it isn't a torn UCL), he wouldn't have made the trip to Kinston. Thankfully, I was wrong. We racked Sedlock. He is such a nice guy. He posed with the boys Sunday after the game, and on Monday, signed their photos. 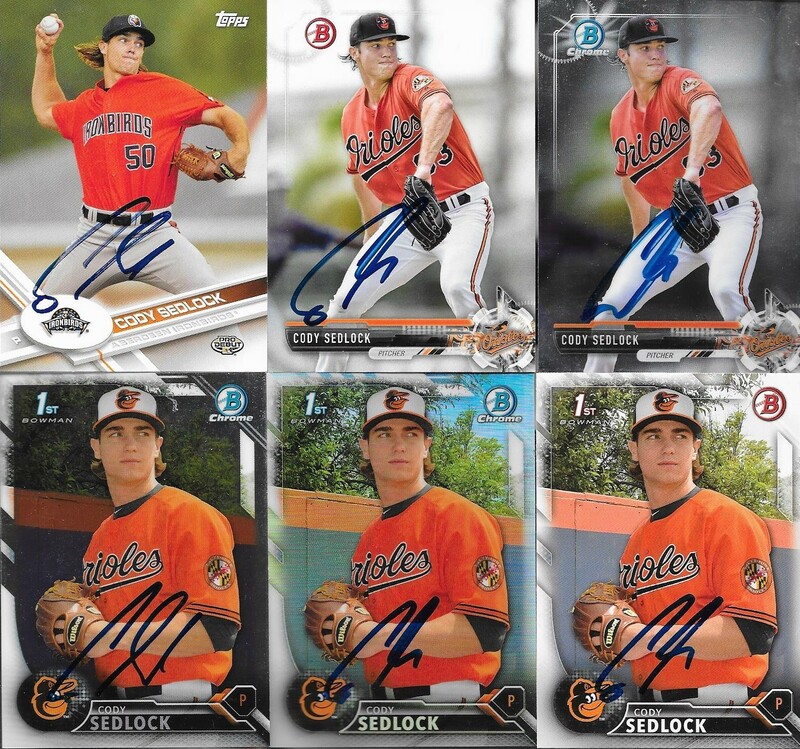 I got a whole bunch of different cards signed by Sedlock, and took care of all of my 50/50s. I even got his Aberdeen team set card signed. On Tuesday, I wished him well, since I won't be seeing him anymore this season. I hope he gets healthy and can contribute this season. I am excited to see him progress, and he has two new fans in Chris and Jacob. 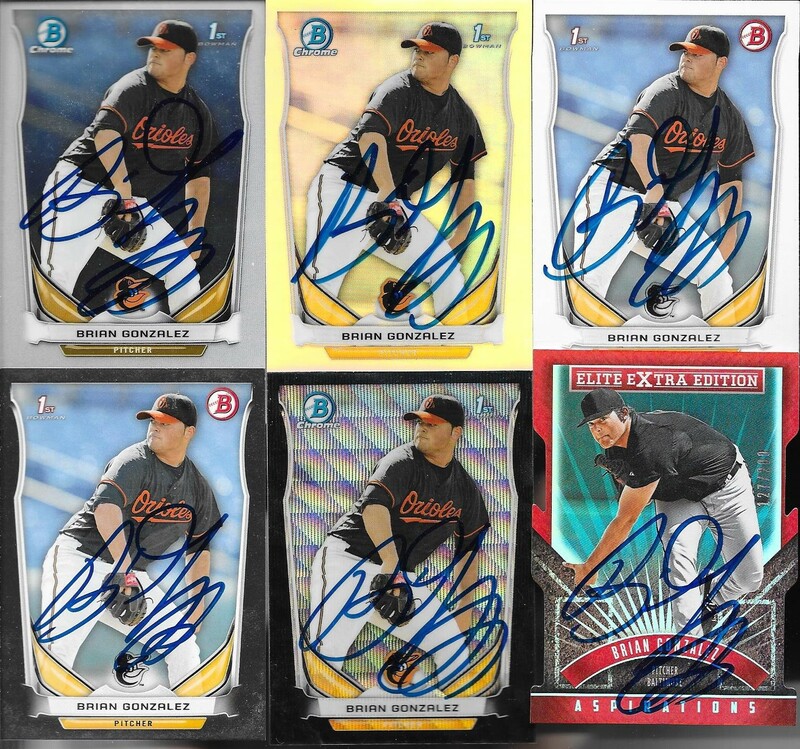 I had a bunch of Brian Gonzalez cards in my Orioles boxes, so I pulled all of them out and got all but one of them signed during this series. They all turned out really nice, and will look so cool in my album. 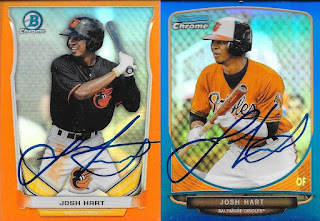 Josh Hart is another player who's cares were scattered all over my Orioles boxes. I was really happy to get some nice parallels taken care of during this trip. The orange refractor is one of my favorite cards in all of the ones I got signed. Hart is injured, and was another player who I thought I wouldn't be able to get while the Keys were in town. I saw him come out onto the field right before the game started on Sunday, but I was able to get him post game. He walked right up to me on Monday saying "You don't even have to ask me, I know what you want." He then signed everything I had in my book at the time. He was really nice, and smiled while signing. I think he saw that my book was turned to his page (he must have recognized his cards), but my back was to him because I was answering a question for Jacob. I turned around and there Hart was. I thought it was pretty funny. I was really worried that I wouldn't be able to get Ryan Mountcastle, mainly because I thought he would get called up before the Keys ever got to Kinston. 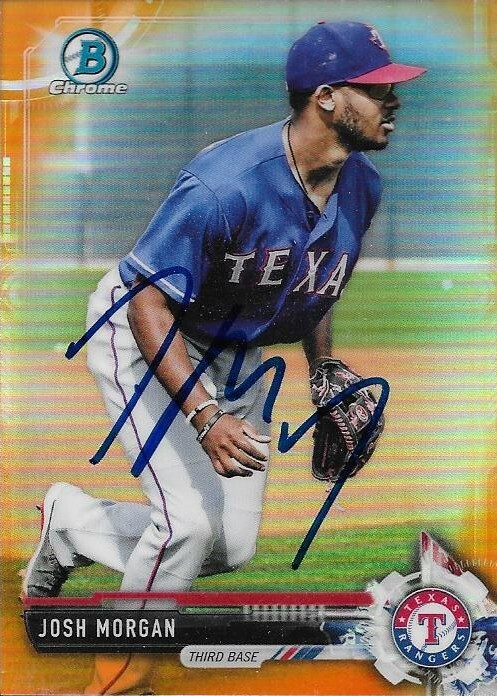 Luckily, he was still with them this week, and I was able to get every card I had of him signed. 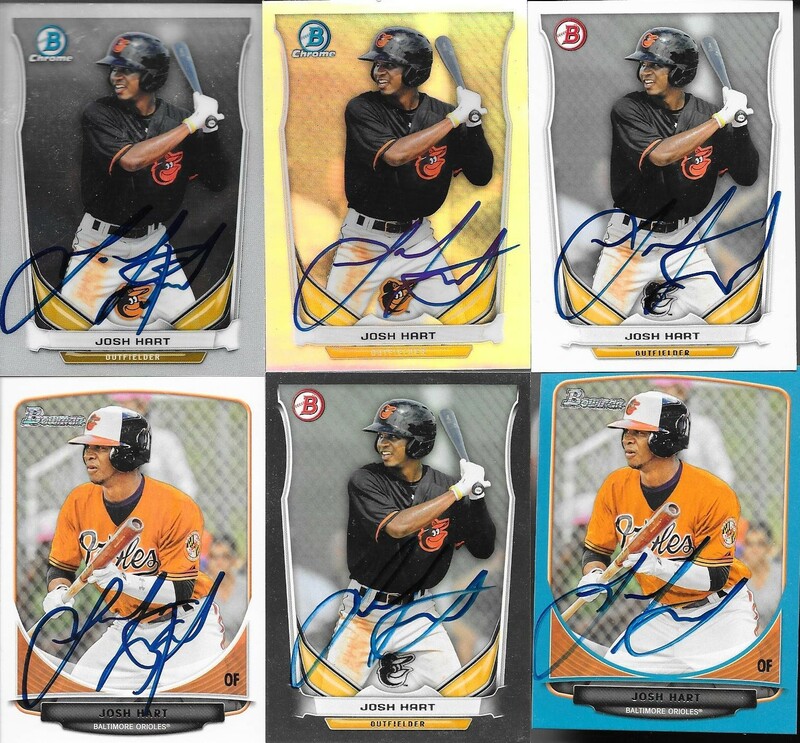 He is one of the top Orioles prospects now, so I wanted to take advantage of my opportunity and get what I could done. The cards will happily take a place in my album. Mountcastle is in a bunch of different sets, so I had a lot of cards to choose from. Trips to the card shop facilitated this venture as well, since Wendell has a few boxes of loose prospect cards to look through. I actually pulled the yellow Mountcastle while I was in Illinois with Andrew. 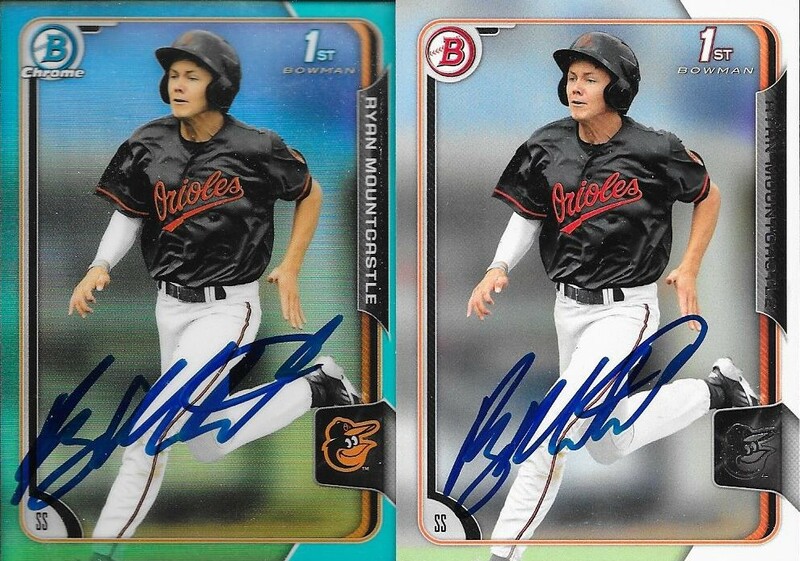 He has some nice Bowman cards, so I was glad to get these signed. The purple parallel turned out really nice. I had a nice little mini PC of Alex Murphy that I started right when he was drafted. The cards were in a box under my guest bed, so I went ahead and put everything in my graphing bag for this week. I got everything signed, and am really happy with the results. The green chrome is numbered 21/75; the silver wave is numbered 17/25 (and I remember it being from an early Instagram trade), while the rest of them are not numbered. 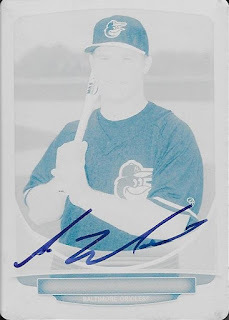 Finally, I used to not like seeing 1/1 cards signed, but since I spent the rest of the Murphy PC on graphing, it was only right that the printing plate end up in my album with the rest of its cousins. It actually turned out really nice, and I am glad I got it signed. 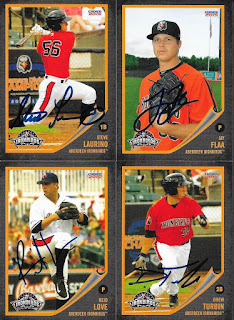 Here is the stack of cards that Chris, Jacob and I got signed. 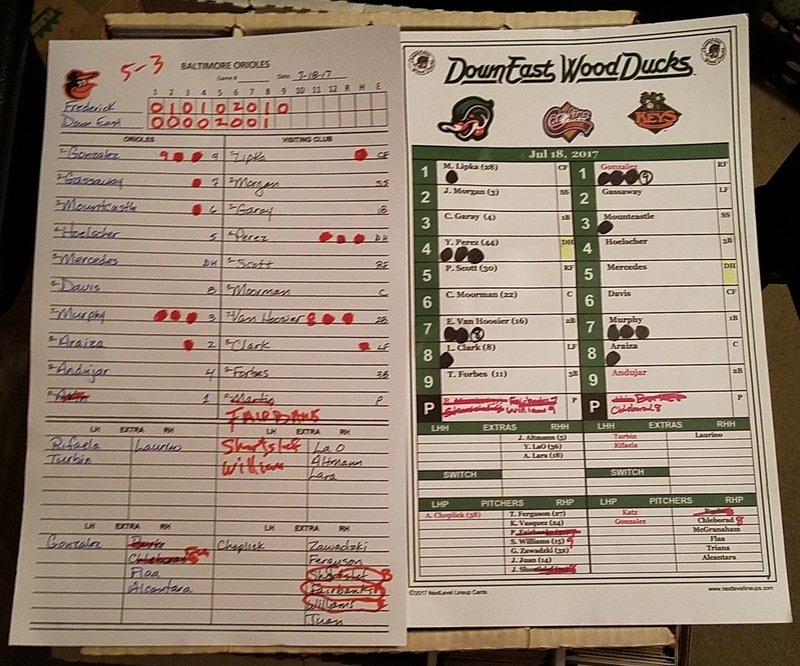 We got 129 cards signed, one photo each for the boys and I printed out a photo of Grainger Stadium and got 6 Wood Ducks on that. 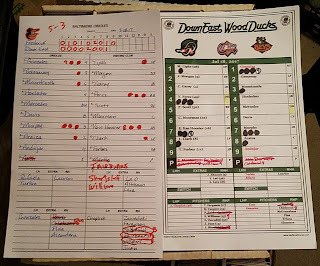 During the final game of the series, Brett Martin pitched for the Wood Ducks. He looked good out there, and is still working his way back to form from his back injury. He took a hard-luck loss, with a few runs scoring on some fluke hits. I think only two balls hit off of him were really squared up. I made sure to ask each manager prior to the game for the lineup cards, and they both came through. 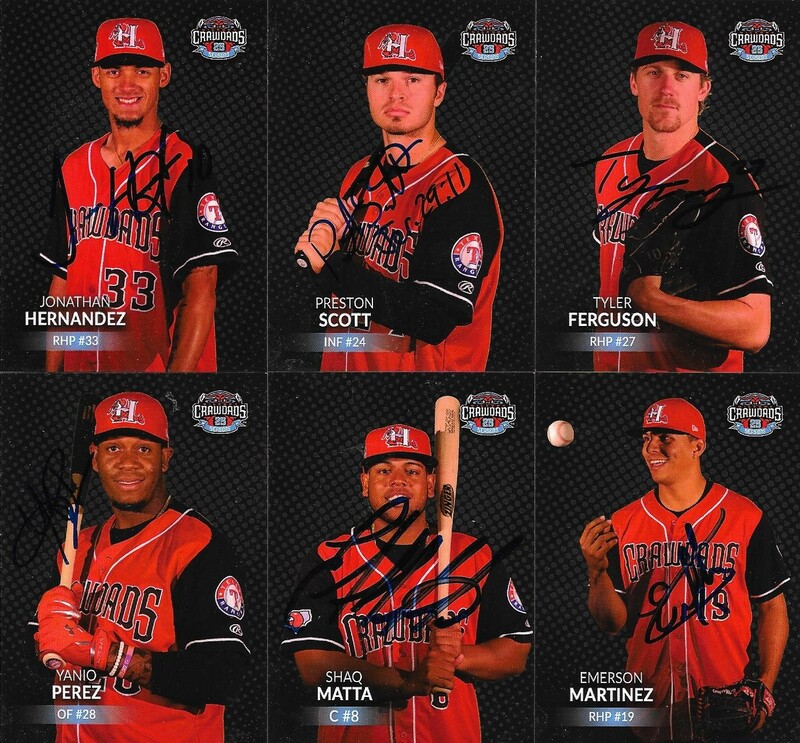 I think I will frame these and hang them up, instead of taking them to the games for signatures. So, We all had a great time at the games, and my nephew has put together a graphing book that he can take with him to Winston-Salem Dash games. I hope he sticks with it, because he seemed to really enjoy himself, and the stack of autos he is taking home with him. I'd like to thank my friend, Neil, for the tickets to each game, as well. 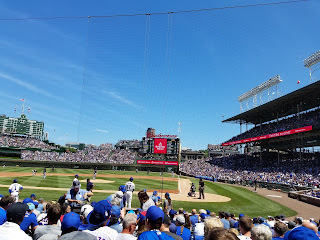 The seats were great and we had an awesome time.